Don’t be fooled: unifying China’s maritime agencies will create new issues, not solve existing ones. The China Coast Guard officially took to the seas last week, to considerable fanfare. An international conference on marine safety descended on Beijing to mark the event. The organizer of the gathering, former deputy assistant secretary of state Susan Shirk, hailed the debut of a unified coast guard as a "positive development." Why? "It's good for China's neighbors and the United States," she opined, "because we know who is responsible and who we can hold responsible." 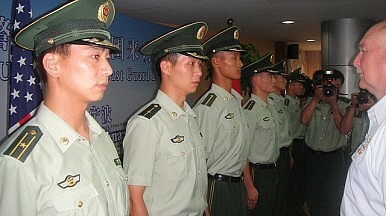 Shirk predicted that the China Coast Guard will pattern itself on its American and Japanese counterparts. As Chinese coast guardsmen "develop a sense of professionalism in accordance with international law," furthermore, "it should make for lower risk of accidents." Well … maybe. An influential Western verdict on China's misconduct at places like Scarborough Shoal or the Senkaku Islands faults skippers for overstepping their authority, whether through an excess of zeal, unclear bureaucratic lines of authority, or situations that fall outside their service's narrow purview. Unifying the hodgepodge of agencies that once policed Chinese-claimed waters — China Marine Surveillance, the fisheries police, and so forth — under one high command should assure that the China Coast Guard executes its duties uniformly, and in keeping with national law and decrees from the political leadership. If not, as Shirk notes, outsiders will at least know where to affix blame. And sure, streamlining and simplifying the bureaucratic wiring diagrams may make some difference — at the margins. Cutting down on accidents that might escalate into something nasty can't be a bad thing. But bear two things in mind. One, even if we stipulate that the controversies agitating the China seas got their start through ship crews' mistakes, Beijing deliberately chose to double down on those mistakes. Just ask Manila, which has effectively lost jurisdiction over an atoll deep within its exclusive economic zone. Or ask Tokyo, whose own coast guard has been run ragged by Chinese enforcement ships — and now, it bears noting, is being run ragged by the four China Coast Guard vessels that took station off the Senkakus around the time Susan Shirk was uttering her hopeful words. These prolonged struggles are no accidents; they reflect conscious political choices made in Beijing. And two, let's not take too much comfort in the idea that the fledgling coast guard will conduct itself according to Chinese domestic law, let alone international law. The Chinese Communist leadership transcribed its island claims into domestic law in 1992, enacting its Law on the Territorial Sea and Contiguous Zone. That's the law the coast guard will uphold. Chinese officialdom, moreover, insists in effect that the claims codified by the famous "nine-dashed line" and other such artifacts predate, and thus supersede, the UN Convention on the Law of the Sea and other newfangled treaties and accords — never mind China's assent to those agreements. Again, this provides scant comfort. With admirable frankness — you've gotta like a stand-up guy — military researcher Zhang Junshe states in the PLA Daily that the new agency's purpose is to "show the international community that China has undisputable jurisdiction over the waters." Zhang, of course, is repeating the standard line that China holds "indisputable sovereignty" over all sea areas and geographic features it claims. And sovereignty means a monopoly of force if it means anything. The coast guard will help impose that monopoly. So in reality, the advent of the China Coast Guard furnishes little cause for cheer among Asian sea powers. In all likelihood, as my friend Arthur Ding of Taiwan's National Chengchi University observes, the new agency will step up enforcement actions. If so, it will generate new frictions rather than smooth them out. It will prosecute Beijing's territorial claims more efficiently and effectively than the previous, motley crew of maritime enforcement services ever could. But hey, at least we'll know whom to hold responsible! Sci-fi master Robert Heinlein had a thumb rule for life: never attribute to malice that which can be adequately explained by stupidity, but don't rule out malice. Creating the China Coast Guard helps rule out bureaucratic stupidity as an explanation for Chinese behavior at sea. Which leaves … hmm.